I must say that I thoroughly enjoy Starbucks coffee. My wallet on the other hand does not thoroughly enjoy Starbucks coffee. Hahaha. 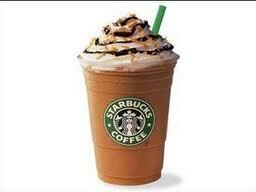 I thought nothing could give me the fix the way a Grande Mocha Frappaccino with Whipped Cream could. But it’s a whopping $4 a pop! Not to mention hard on my diet (it’s not really a diet versus just trying to eat healthier). I had to rethink my coffee habit. If I buy that 3 times a week, for 1 month, it’d cost me just about $50! That’s a new pair of shoes! This translates to roughly $575 dollars a year! Or 12 new pairs of shoes!!! To cut down on my expensive frappaccino habit, but not totally deprive myself of that which is good (coffee), I found a cheaper, but comparable substitute. I now order a Grande Vanilla Iced Coffee with 2% Milk. This costs closer to $2. Which translates into $25 dollars a month and $288 a year. That’s like cutting down on the coffee spending by HALF! And if you can manage to keep your Starbucks visits below 3 times a week, or settling for the average homemade cup of joe, the savings are even better! However, I like going to Starbucks, especially because of the social aspect. I go with family and my significant other and it’s sort of something we do more as a bonding experience than for the coffee or smoothies. ♥ So I chose my cheaper substitute more often than not. 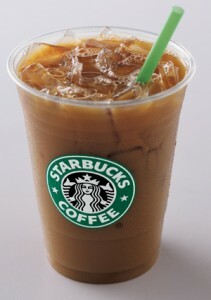 What do you like from Starbucks? Do you have any suggestions for smarter substitutes (food, clothes, products, etc)? Starbucks Venti iced Doubleshot. It’s like $2.40 or somethin. Way under $3. Five shots of espresso, sweetened. Bam. Best bang for the buck if you’re going to buy it instead of make it your own. It’s not on the menu anymore, so if they look at you funny ask for the venti iced sweetened Americano. I’m totally the wrong person to ask for alternate suggestions. Since I rarely go to Starbucks, I just get whatever I want :-P. Which is normally my strawberries and cream frapp. But I agree that it’s more about the social aspect more often than just for the rush that coffee provides. I like going with you and Bryce. Coffee shops can get real expensive! I usually get a iced soy vanilla latte, but it is around 3.50, so not cheap. But I don’t go very often, cause it is so much cheaper to just drink green tea from home.